This month, during Prime Minister Justin Trudeau’s visit to Mexico, multiple videos circulated showing Mexican women legislators acting like teenagers, pushing one another aside in order to take a selfie with the leader who has been promoting his government to the world as feminist. Radio Fórmula reporter, María Eugenia Rojas, went even further. Using one of only two questions Mexican journalists could ask at the end of a press conference with the Prime Minister and the Mexican President, she asked about Mexico's position concerning what happened in Catalonia (completely irrelevant to the moment) and then jokingly asked for a photo with the Canadian Prime Minister. At the end of the press conference, Rojas got her picture taken with Trudeau, Mexican President Enrique Peña Nieto, and their wives. With a big smile, she exclaimed, "I love him!" Several Mexican journalists defended her attitude – unacceptable in any serious news agency around the world – arguing that there were no fundamental questions to be asked. In other words, these journalists were comfortable with the subservient role to which Mexican journalism has been reduced after a century under the authoritarian thumb of the Institutional Revolutionary Party (known as the PRI, which returned to power in 2012). But were there really no fundamental questions? Three days after Trudeau's visit concluded, a delegation of Mexican human rights defenders flew to Canada to talk with officials, parliamentarians, academics, and Canadian society about everything the Mexican government insists on hiding: that the country is experiencing a massive and systemic human rights crisis, hitting, above all, Mexico’s indigenous communities, women, human rights defenders and journalists. The visit was organized by the Americas Policy Group of the Canadian Council for International Cooperation, including civil society organizations such as Amnesty International, Peace Brigades International, MiningWatch Canada, Nobel Women's Initiative, United Steelworkers’ Humanity Fund, CoDevelopment Canada, the Public Service Alliance of Canada (PSAC) and CUPE, among others. The Mexican defenders that formed the visiting delegation were Santiago Aguirre from Centro Prodh; Gustavo Lozano from the Mexican Network of Mining Affected People (REMA); Araceli Tecolapa from the José Morelos and Pavón Human Rights Centre in Guerrero; María Martín from JASS Mesoamerica; Professor María de la Luz Arriaga; labour lawyer Arturo Alcalde; and Julia Quiñonez, a maquiladora workers' leader from Coahuila. They brought to the discussion a range of issues pertaining to education, labour rights, Indigenous communities, crimes against humanity, forced disappearances, extrajudicial executions, dispossession, murders of journalists and activists, and gender rights violations. Roberto Abel Jiménez García, leader of Section 22 of the national teachers’ union (SNTE), was unable to participate since the government of Canada did not give him permission to enter the country. Lastly, I was invited to discuss the situation of journalists in Mexico, something within Canada’s area of interest. The three-day visit was filled with meetings with Canadian unions, universities, parliamentarians, as well as a press conference and interviews. Our delegation was able to explain what is happening in Mexico and, above all, raise an issue that directly involves Canada: large-scale mining. This is not a minor issue. Mining is an important source of foreign exchange for Canada, and Canadian mining firms control 840 of the 1,327 mining projects in Mexico right now. "Canadian companies are killing Mexican communities," recounted Gustavo Lozano from the Mexican Network of Mining Affected People to Matt DeCourcey, Parliamentary Secretary to the Minister of Foreign Affairs, who simply answered that he would let his team know what the Mexicans had told him and that he was disappointed that the delegation that just went to Mexico did not receive this information. 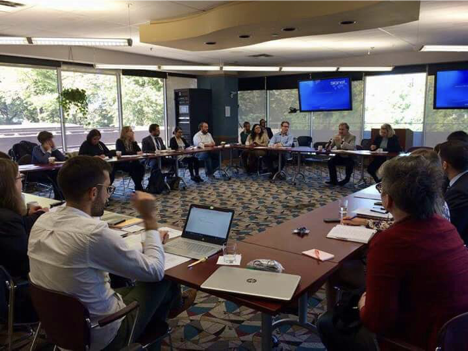 However, the most challenging meeting took place on October 18th at Global Affairs Canada (GAC). It was led by Kevin Thompson, director of GAC’s North America Policy and Relations division. There, for almost three hours, we spelled out the reality that the Canadian government does not want to see. Are you aware of Canada's responsibility in Mexico’s human rights crisis? How can the Canadian government make mining companies accountable for violations of the human rights of Mexican communities? How do you incorporate the Canadian government’s guidelines on the rule of law and the rights of women into the trade sections in your embassies abroad? Does the Government of Canada have any messages for the families of people who have been murdered or forcefully removed from their land as a direct consequence of Canada’s economic diplomacy? The last one was not a question, but a scolding: How is it possible that the U.S. government, in spite of all its anti-Mexico discourse, came out more forcefully than Canada against the tenth murder of a journalist in Mexico this year, which took place just days before Trudeau's visit? The GAC officials tried to evade the issue and return to more comfortable subjects for them, effacing Canada’s role in the crisis and replying that Mexico does not readily accept outside criticism and that the solution to the serious crisis we had laid out is up to us. But, those of us who participated in the Mexican delegation know very well what the Mexican government is like and what we must do in the face of this crisis. Every day, human rights defenders in our country put their lives on the line to confront a cynical and corrupt government that pretends to take positive steps. What we need to know, I insisted, is whether the Canadian government understands the direct responsibility it has in the widespread violence in Mexico. Above all, we want to know what the Canadian government will do to hold Canadian mining firms accountable, so they abide by international standards and stop violating the human rights of Mexican communities, as has been documented by the UN Working Group on Business and Human Rights. What can Canada do to prevent its economic diplomacy from cancelling out the important work its embassy does in Mexico in support of local civil society organizations that fight for human rights? Canada must also look out for its own interests, responded the foreign affairs official: "The reason why Canada is such a prosperous country has to do with mining activity." This was the breaking point. As a group, the whole Mexican delegation lined up behind the key message that we wanted to deliver: there is no justification for Mexicans having to lose more lives in order for Canada to get ahead. Just imagine for a moment: I have a neighbour who is hardworking with all his business in order, and I can see that his house is getting bigger. I cannot get angry about that. Nor can I blame him for the fact that my house is dirty and a mess. What I cannot accept is, taking advantage of the fact that my house is falling down and my parents are violent drunkards, that this rich neighbour takes our food and leaves us his trash. That is what Canadian mining firms are doing to Indigenous peoples in Mexico, Gustavo Lozano and Araceli Tecolapa explained to Canadian officials, using other words. It was not easy. But in the end, Thompson himself had to accept that they did not know the full extent of the situation. He committed to having a "deep discussion" with the Canadian embassy in Mexico "on the services that it offers to companies" and increasing direct communication with Mexican civil society. He also said that foreign affairs will seek to better understand the situation in order to support well-behaved companies, but “with those that are playing such a negative role, we have to take action." We do not really know what the actual results of the delegation's visit to Canada will be. We want to believe that a crack was opened, allowing some light to enter in on the dark Mexican panorama. In any case, after listening to the interventions of the Mexican delegates and witnessing the efforts of the Canadian civil society network, I am certain that there were indeed fundamental questions that needed to be asked of Prime Minister Trudeau during his visit to Mexico.